Maybe they got my number mixed up with Trinidad’s. Oh well, I figure, why not give my two cents anyway. Before I do, let me first say two things. 1) I’m not going to tell you who can say it and who can’t. We are all adults here, and you can do what you want. The problem some of you will run in to is, everyone has their own rules to it, so real talk: use at your own risk. And 2) for the sake of brevity and reality I’m going to use terms such as “us” and “them” from time to time. Normally, I try not to use such terms. However, we are talking about a very divisive topic here, so in certain points, it is only appropriate. The N-word, according to Dictionary.com, is a noun with only slang definitions. It is defined as A) “a contemptuous term used to refer to a black person or a member of any dark-skinned people” or B) “a contemptuous term used to refer to a person of any racial or ethnic origin regarded as contemptible, inferior, ignorant, etc. I’m going to take those one-by-one. The N-word is a thought. It is an emotion. It is an energy. It was created by bigotry fueled by the oppression of “Black” people. The word cannot be fully explained, it can only be felt. You can only see its effects. It is not just heard, it is experienced. That experience is hate. Pure unadulterated hate. It has killed. It has maimed. It has ruined. It is more than just a word. The N-Word IS like a CANCER! Please note: I am not trying to minimize cancer. Cancer is the absolute worst. I am merely drawing a picture where we can all recognize the characters. You already know Cancer. Cancer kills. It’s what it does. So when you find out you have cancer you have two options: You kill it, or it kills you… And to kill it, you have to kill it all or it might keep coming back. I’ll repeat: You don’t just live with cancer. You kill it. Or eventually, it kills you. Many times when a cancer is not completely eradicated, it will not only come back, but it may come back stronger, more complex, and in a different more lethal form. I’m now going to make an assumption: I’m going to assume that we can all agree, that in some measurable way, smoking AND second-hand smoking actually do cause cancer. Taking that assumption, the original creation and usage of the N-Word is like “White” people smoking packs and packs of cigarettes a day and exhaling each puff in the face of every “Black” person they could find. Guess what happened?… We all got sick. The N-Word sadistically infected the hearts of those who chose to spew it in our faces, and it infected our minds. It told us we weren’t human; we weren’t to be valued; we did not matter. Over time, as a country, we came to realize we were all sick, but we did not have a cure. We had movements, protests, rallies, songs, fundraisers, town halls, prayer services. At some point, television and media convinced us that we pretty much got it all. I mean, yeah there’s a few people still struggling with the decision but we beat it! We killed it right? …But we didn’t get it all. Those who used the term to oppress? Some actually quit cold turkey. Some convinced the people around them that they quit, but still use it in private. Some only do it when they drink. You can justify it however you want, but you are still breathing that hatred back in. Did you catch what happened in the question? The boys chanted about “N____s” presumably in general, but these reporters took that term and applied it to me. Remember, it’s not a synonym to “black,” it is a term of contempt. Is that nitpicky? Probably, but what I’m saying is that the term is used so much that people who don’t think it applies to black people still consider it a synonym for black people. As far as I’m concerned there has never been a N___ SAE. I don’t even know what that is. Those of us who were oppressed by it? My people? Now, we really killed it, didn’t we? No. I hate to be the bearer of bad news, but we didn’t even try to kill it. We decided to live with it. (Remember what I said about living with it?) We took it, and we made it cool. We adopted it as our own, as if it was something we always wanted. We changed how it is spelled and we even came up with acronyms of pride. We made it a term of endearment. See, as I said, many times when a cancer is not completely eradicated, it will not only come back, but it may come back stronger, more complex, and in a different more lethal form. That’s hatred returned, and coming out of us! Deep rooted hatred of people, not because they don’t look like us. Actually, they look JUST LIKE US. No, we hate them simply because we don’t know them. We aren’t sure where they are from. Does any of that sound familiar to you? Remember that second definition of the N-word I mentioned before? “A contemptuous term used to refer to a person of any racial or ethnic origin regarded as contemptible, inferior, ignorant, etc? We tried to take its power away, but we failed. We tried to make it something that it wasn’t. But hate did what hate does, and it came back with a vengeance. We use it the same way they did. The same way they do. It infected our minds, then spread to our hearts, our mouths, even our full identities. It is completely widespread. Widespread to the point that we have helped cause the dictionary to draw a parallel between being “Black” and being inferior, ignorant, etc. because even “black” people use it that way. The word that had no meaning, now does. So what now? We’ve tried everything else, and nothing has worked? I say, it’s time to kill it. It’s time to MAKE it die. Am I saying you can’t say it? No. I’m saying you shouldn’t. I’m saying you shouldn’t want to. You shouldn’t want to say it any more than you should want to keep smoking cigarettes after beating lung cancer. You shouldn’t want to say it because it will ultimately bring hate, pain, and conflict. It’s not time to make a list of rules of who can and can’t say it and when. It’s time to shut it down completely. Killing the N-Word starts at home. It’s a personal decision. That’s why I’m typing “the N-word.” I’m not protecting your sensitive eyes or minds. I’m not using it because I don’t use it. Ever. I don’t sing along to that word in songs. I don’t use it with my friends or family. I simply don’t use it. I’m choosing to kill it and, for what it’s worth, I think you should choose to kill it too. We can pull this off, if we do it together.. Previous The “LAST BLACK SAE”… I hate that name. Wow – the honor of being first to comment. You really said it. I am totally with you on this. It’s not word I use ever. You really have laid out the reasons wonderfully. May I make some observations about that segment and about the way CNN has been handling this story? 1) I found it very, very strange last night that it was two African-American/Black gentlemen basically saying the n -word should live and one white fellow saying it should die. Really strange. 2) I wonder, I just wonder if any other ethnic group is using a derogatory term against them in any similar way to the way the n-word is used by some African-Americans? 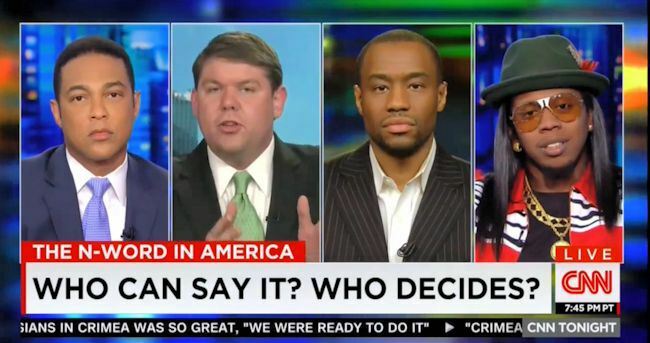 3) In your segment and in the segment last night, I noticed all the panelists were male, unless I’m mistaken. Aren’t we women affected by race and language as well? 4) I’m wondering if, unfortunately, there might be more to the story. I thought I saw in one news report somewhere that one of those involved in chanting said they’d been taught it. Really? By whom? And that makes one think of a certain song from “South Pacific” – ‘You’ve got to be carefully taught…’. I’m fascinated with wonder about how other races view this issue for sure. I mean, why is everything Black vs White? Why is that just accepted? We don’t give other races and ethnic groups their own voice, we essentially just tell them to pick a side? Isn’t that racist too if you think about it? I’m glad to see someone else isn’t just seeing whats being shown and is digging and thinking deeper! That means, hopefully, the national and global conversation is growing….I really love these questions! I’ve got to figure out a way to address them or have them addressed. Thank you! You’re so welcome, William. It’s great to hear you’d like to address these issues – you’ve already outlined some great questions to investigate! As you continue your quest, you might look at the work of Prof. Ian Haney Lopez – he was interviewed at that start of that second night. He is, of course the author of “Dog-Whistle Politics” . He was also just on BookTV and really had great insights about this frat story – although I can’t really quote him exactly of course. BTW, I thought your insight about the question you were asked about the frat member not knowing their history and your observation that the reporter(s) had tied the n-word to you and your further observation that it was NOT a synonym for ‘black or African American person’ was the most telling in all of your post. That word is so sneaky we too often don’t see it’s negative effects. Will be looking for more from you!!! Anyway, thanks for the great reply and continued Godspeed!